The M60 Machine Gun is a family of American machine guns, firing the 7.62 x 51 mm NATO cartridge. In the U.S. military, it has largely been replaced by various versions of the M240 machine gun. However, it remains in use in every branch, as well as some other countries (another major user was Australia); it continues to be manufactured into the 21st century. This download has detailed information on it's history, the design and problems of this magnificant weapon. Also covered is information on the ammunition it uses and variants of this machine gun. Covered are the M60, M60E1, M60E2, M60E3, M60E4 and MK34 Mod 0/1. Also covered are the M60B, M60C and M60D. 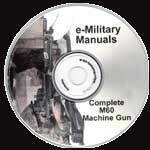 This CD & download also has two short but fun videos to watch on the M60 machine Gun.